Say What? 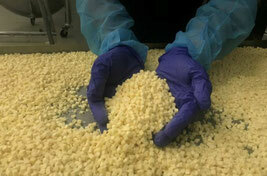 Freeze dried cheese hits the market. Summary: SKIP the crackers and go straight for the cheese with the latest product launched by Yandina's Freeze Dried Industries. Summary: Crunchy cubes of freeze-dried cheddar cheese are appearing on supermarket shelves as snack food as an Australian processor tackles the problem of fresh food waste. Frozen Food the Future. 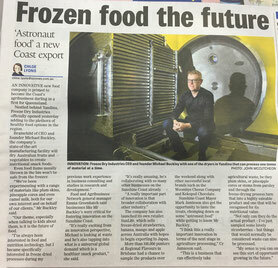 "Astronaut food' a new Coast export. AN INNOVATIVE new food company is primed to become the Coast's agribusiness darling in a first for Queensland. Nestled behind Yandina, Freeze Dry Industries officially opened today, adding to the plethora of healthy food options in the region. A professor at La Trobe University in Melbourne has been investigating enzyme from pineapple that may provide a source for a new alternative to antibiotics. 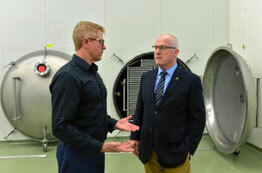 The colossal wastage of fresh produce in Australia could be a thing of the past thanks to a new freeze drying factory being built at Yandina. And the cutting edge expertise could eventually lead to technology exports and improved healthy food availability around the globe. 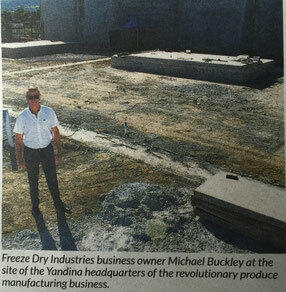 "My philosophy is to attack the wastage," Michael Buckley, of Freeze Dry Industries, who is behind the factory and has driven the innovation process, said. "If you've got a perishable food, and if we can transform it into a stable long-shelf-life product, we can add extensively to its value - we've then got a product that's storable and transportable. "I want to be able to put this footprint anywhere in the world and lead a value-adding, zero-waste Australian manufacturing fightback". The factory will boast Australian-made world-first technology for freeze drying and locking in the natural goodness of fresh mangoes, pineapple, apple, plums, banana, strawberries and more. "We are also working very closely with our key partners such as Nutrafruit and their exciting Queen Garnet plum variety to ensure the highest possible health and nutritional outcomes." The process means the tonnes of produce like strawberries, for example, that are spoilt each year, could instead be freeze dried, without any preservatives and chemicals, so as to greatly increase shelf life, reduce weight so as to improve transport efficiencies, and make healthy natural foods available more readily when needed. 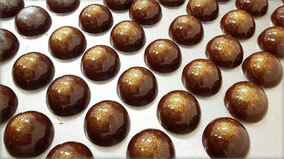 The foods make ideal tasty health snacks for children and for school tuck shops. Recent trials have proved extremely positive from parents. 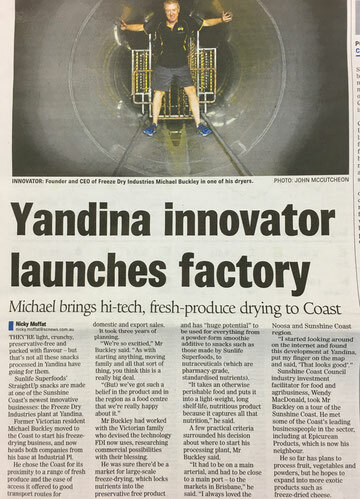 Mr Buckley said the Yandina factory was expected to be completed by around September, with an initial five one-tonne processing machines that could potentially process some 500,000kg of produce annually. The freeze dryers are less than half the size and use some 5% of the power of rival Chinese made machines; the Australian machines also use a more computer controlled gentle process that results in a quality product. The freeze dried mango sampled by the Sunshine Valley Gazette had a texture similar to a very light crispy honeycomb and great taste. It takes a minimum three days to process the produce, to protect the molecular structure of the cells and extract the moisture. "It's a very slow and gentle process to retain the integrity of the fruit and that is what sets us apart." The technology can also apply to vegetables - such as sweet potato and beetroot - if there is a sufficient size market, and could lead to powdered freeze dried vegetables for health shakes and possibly even some future applications with medical cannabis, other nutraceuticals and super foods. In the future the vision is that these hi-tech machines can easily be loaded onto a truck, so could actually be shipped to where needed by farmers. "We can go where the produce is; we could have fruit and veg co-ops around Australia that could have four or five of these machines shipped in just for the season and they could create a product that has and is zero-waste and has a long shelf life which is easy to store and economical to transport," Mr Buckley explained. Mr Buckley said he hoped to open his factory with between five and 10 employees. He is currently networking to link up with farmers, suppliers, transport companies and food distributors. Whole Foods Market is embracing food technology. Last week it hit the food tech press after launching the sale of Beyond Meat’s ‘Beyond Burger’ in its Boulder, Colorado store, and last month it was also in the news for extending its partnership with food e-commerce startup Instacart by making an investment in the company. The global food system is ripe for disruption. Population growth and increasingly salient impacts of climate change are putting new demands on the system, and incumbent players are under pressure and struggling to respond. It is clear that the industry needs novel solutions, and that technology can help. The science behind superfood stories: Antioxidant properties of raspberry and blackberry fruits grown in Central Europe. Roughly 8 percent of people in the US suffer from post-traumatic stress disorder (PTSD). SSRIs, such as Zoloft and Paxil, are the only currently-approved therapy, but their effectiveness is marginal. Researchers have found that blueberries could be an effective treatment. The new iteration of the Dietary Guidelines for Americans must incorporate sustainability considerations -- both for the health and wellbeing of Americans and the world in which we live, urges a new article. Researchers have shown a diet containing dried plums can positively affect microbiota, also referred to as gut bacteria, throughout the colon, helping reduce the risk of colon cancer. Eating a lot of fiber-rich foods, such as fruit, vegetables, and legumes -- typical of a Mediterranean diet -- is linked to a rise in health promoting short chain fatty acids, finds research. Fruit must be an essential part of our diet. Experts recommend eating at least five servings of fruit and vegetables a day. However, the reality is quite different, since we are witnessing a gradual decline in consumption, especially among children. This is one of the reasons that made a team of Valencian researchers develop new products that could promote fruit consumption.